The default options for downloading Microsoftâ€™s SQL Server 2008 Express at www.microsoft.com/express/Database/ will have you downloading the application through the Web Platform Installer. This is suitable for installing on a local computer, but if you want to install it on multiple machines, especially those that do not have an Internet connection, its best to do it with a standalone version of the installer. There is a 32 and 64-bit version and you may need to download other applications in order to install the database server, i.e. .NET Framework 3.5 SP1, Windows Installer 4.5, and PowerShell 1.0. There is also an option for download documentation for offline viewing. If transmittals canâ€™t be attached to an Adenium DFS order, you need to give the aspnet account in IIS full control over the GlobalCache folder in the theme. 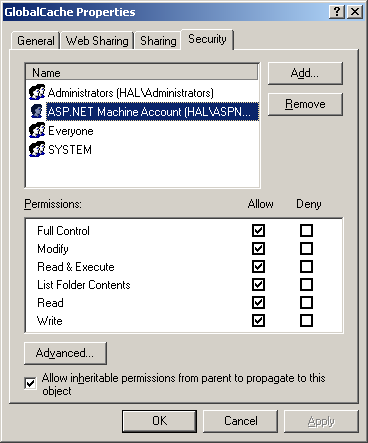 In Windows 2000, full control is given to the ASP.NET account (see below). Each theme needs these permissions on the GlobalCache folder. Transmittals can then be attached with each order. Left click the Start button and then select My Computer. If this option is not available, then right click the Start button and select Explore. My Computer will be in the folder list. If My Computer is open, select Map Network Drive from the Tools menu, or alternately, if Explorer is used, right click on My Computer and select Map Network Drive. 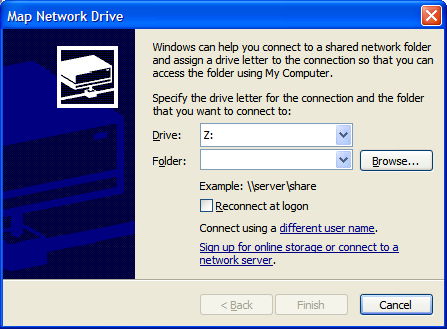 Select the drive letter that you want to use and the network folder that it will be assigned to. Press the Finish button and open Windows Explorer. You will see a new drive letter that will open the network folder that you assigned to it.